Market View: Should A Food Marketer Have an MBA Or MS? Home / Articles / 2018 / Market View: Should A Food Marketer Have an MBA Or MS? Everyone who wants to advance in their company should get an MBA, but it is the minimal preparation for being a good food marketer. I have been teaching in an MBA program since 1974. I think it is a good preparation for managers, but I don’t think it is ideal for managers who want to be food marketers. Needless to say, after someone spends thousands of dollars, gives up at least a year of their life (at the minimum) and probably forgoes a year of salary, they don’t want to read anything negative about their degree. This is one area on which I feel extremely qualified to offer an opinion. To better understand the food industry, and unlike many of my academic colleagues, I have taken off a number of years from the university (leaves of absence) to work in the food industry. I have been a director of marketing research for an advertising agency, worked in food retail in Germany for a German retailer, and was vice president of marketing for an international coffee company. My concern is not that the MBA education is not valuable to food marketers but rather that it is not the “ultimate preparation” to be a food marketer. It is not the knowledge that the MBA students get that I object to, it is the assumption that the degree or knowledge has prepared them for the food marketing business. How many people with a serious gastrointestinal problem want to go to a doctor for who had just finished medical school? To give people the confidence to put their lives in a doctor’s hands, a patient expects more education in the doctor’s specialty and regular seminar updates on what is new. A medical degree is a necessary but insufficient requirement for a physician; likewise, an MBA is a necessary but insufficient requirement for a food marketer. The same senior executive who turns over his brands to raw brand managers would never turn over his children to a raw pediatrician. And many of our brands are in the hands of people whose primary preparation for the job is an MBA. I think an MBA is an excellent way to learn how a company works and how to deal with basic finance, accounting, human resources and marketing issues but this does not make a food marketer. In fact, for those of you who don’t know this, an MBA is a general business degree, and good schools limit the number of courses that you can take in any one field to guarantee the breadth of the education. I encourage everyone who wants to advance in their company to get an MBA, but I think it is the minimal preparation for being a good food marketer. One solution many universities offer is a master’s of science degree in food marketing (MSFM). Rather than being a broad-based educational program, like an MBA, a master’s of science is focused and targeted on food marketing. Rather than limiting the number of courses that can be offered in one area such as food marketing, the MS degree maximizes the courses in that area. At Saint Joseph's University, classrooms are filled with students from various segments of the food industry who only talk about the issues and problems in the food industry. They must also study all the dimensions of food marketing such as food marketing strategy, food marketing advertising, food trade and consumer promotions, etc. Naturally they must also take some courses in the more general financial and accounting areas. For those who already have an MBA, and good for them, it is possible to take very specific, targeted food marketing courses. Like SJU many universities offer certificate programs in food marketing. Most universities, including Saint Joseph’s, have their programs on-line. But let me be clear, these are not training courses, they are education courses. Most employees still need training in how to accomplish certain tasks, while education helps them to decide what tasks should be done. You might think the food industry would praise universities for focusing programs just on the food industry. Au contraire! When some of our students go to work at food companies, the executives very often say "but you don’t have an MBA," and "what is the MS degree?" I think there are many ways of getting a good education, and only one is to get a degree or certification. Universities do not have a monopoly on learning. However, if you are evaluating possible employees, make sure you understand what type of degree they have. Don’t anoint one type of degree with “almighty” status when there are others that also provide a meaningful and valuable education. An MBA may be a necessary requirement to run our food companies but it may not be sufficient There are other choices. Market View: Are Your Marketers Competent? Do they understanding all aspects of the food business, A to Z? 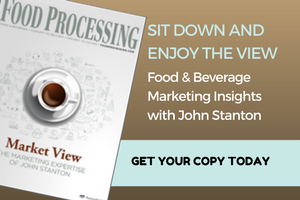 Market View: Are You Marketing or Just Advertising?